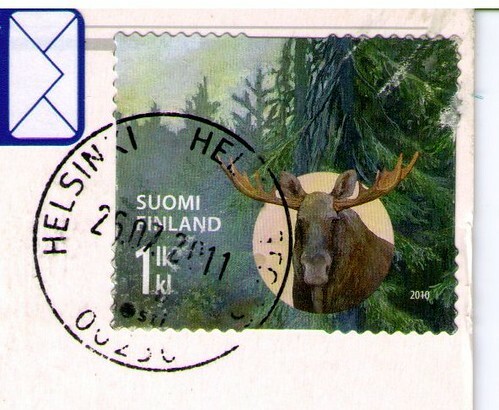 I got a Postcrossing postcard yesterday from Finland, with this wonderful stamp. The moose in the forest is pretty awesome, but it also has raised dots on it that I assume are braille. It's hard to see them in this scan, but can you see the circle dot on the moose's snout and head, and the one at the edge of the tan circle to the left of its nose? Those are the dots. Very, very cool. 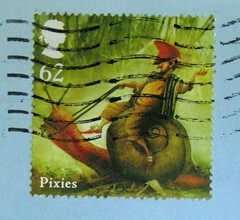 I've said it before and I'll say it again: Finland has the coolest stamps. Neat. If it is Braille, the dots will be arranged in cells two dots wide and three dots tall. The number 1 (which I'm guessing will be on the stamp based on the design) is a backwards L shape (one dot at the lower left and three down the right side) followed by a single dot at the upper left. Joseph, thank you for sharing your wealth of knowledge! The dots do indeed follow that pattern, with the reverse L and all, so I'll consider your comment our expert confirmation.